Good morning. You probably are too busy now, brainstorming the next catch-phrase that would take the nation by storm and make its way into common man’s vocabulary. I understand. And I promise I won’t take much of your time. But before I begin let me introduce myself. My name is Rajrupa and I am someone you would call a target demographic or perhaps simply a consumer! I love the commercials you make, so much so that I never let my husband change the TV channel during a commercial break. I also religiously spend half of my each month’s salary buying things I don’t need, solely because I love the commercial. I am someone in awe of your creativity, the way you tell a story in thirty seconds. 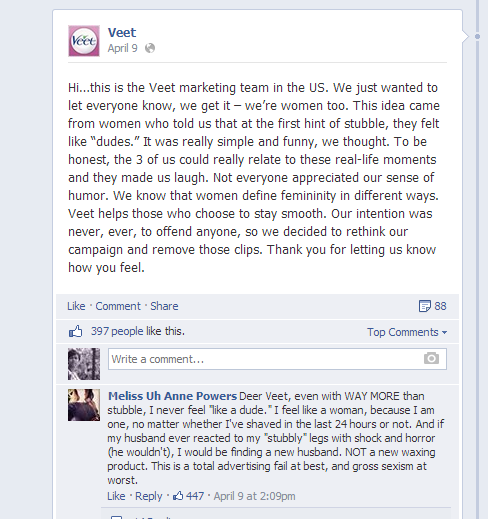 But then I watched the Veet Ad last month and I couldn’t believe what I was seeing. I turned to my husband and asked, “Are you seeing this?” He simply nodded with his brows raised. Now, I do get that your bread and butter depend on how well you manipulate your consumer’s psyche. Their insecurities, their egos are the Turup’s cards you have up your sleeves. And normally it’s funny how well you play them. But this time you blew me off my feet. This was really all I had needed at the end of day to collect my drooping limbs up and rush to the nearest pharmacy to buy a box of Veet. After all I too hadn’t waxed/shaved my legs for some time now! But then even if I were to go out, no taxi driver would stop for me because of my stubble. Or worse, what if, god forbids, I encounter an accident on my way and the medical practitioner cringes at the sight of my stubbly legs! What will I do then? I would die of shame! Wouldn’t I? So on second thought I ditched that idea. But still there was a more important issue to handle. So I asked my husband, “Do I turn into a man every morning I get up? See I have got stubbles!” He confirmed I didn’t. I wonder why you thought of making such an advert! “Don’t risk dudeness!” That’s your tagline, isn’t it? Oh, you think it’s funny! I know. I read this! But I think you are way too smart for me, because I simply don’t get the joke! You say all you want is to help women who choose to stay smooth! Is it not more like forcing women to “stay smooth” by shaming them? After all, is a medical practitioner really all that judgemental to cringe at the sight of an unshaven leg? Then why add the fear factor? Why must you make a woman worry about her stubble when going for a health examination? Maybe in some twisted way it seemed fun to you, but I completely missed the point. It was disgusting! Or even the taxi driver? A sweaty dusty taxi driver doesn’t stop as soon as he sees the hairy armpit! I mean what more insult could you throw at a woman? Oh yes, turns out you could! A wife turns a man magically with a day old stubble and the husband is scared of waking up beside her! I mean, really! What fun! I understand that you have to sell a product that propagates the cruel and unnatural social myth that woman hair is repulsive. It shouldn’t be okay for people to say they are disgusted by female body hair – the very nature of our bodies. But it is okay for people to say that, because in our society female body hair is such an abomination that it incites repulsion and shame. But to do what you have done in your commercial is way too much. Agreed, you have taken it off! But there was no sorry said! To think that even in today’s world, supposedly modern and smart men/women like yourselves making such regressive adverts that manage to be sexist and homophobic at once, and calling it a joke, is scary in itself. Don’t you realize that? I do hope that it was an isolated tangent idea of yours and soon you will be back on track making meaningful commercials that relate to us! Because you have just lost yourself a bunch of loyal customers! And I think, in time, your business sense will appeal to you, if not the social sense. Oh boy.. that is ridiculous.. aweful I wish these people have some sense of moral responsibility ..